Surveys often don't uncover enough information to motivate people to make significant changes. Verbatim comments from interviews provide the detailed information that a leader needs to understand needed changes in managing the business and leading people. Clients often struggle to understand conflicting information from their manager, peers and direct reports. The detailed information gathered during interviews helps explain why different groups have such different perceptions and needs. Leaders who have been successful with their current style can be defensive and reluctant to make changes, unless they understand the negative consequences of their current behavior and the bottom line risks of not addressing leadership development areas. This information is gathered during the interviews and fleshed out more fully in the 360 feedback session. Receive specific targeted feedback from key peers, direct reports and managers collected from interviews with our consultants. 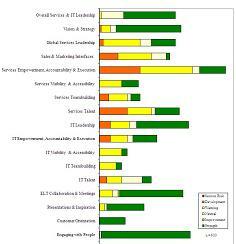 Review a comprehensive leadership assessment report reflecting interview feedback in narrative and chart form, organized into competencies. Review 360 feedback in a face-to-face session with an executive coach to ensure understanding of reviewers' input and create a leadership development plan with specific, detailed action items for improvement. Address specific behaviors to modify and the follow-through plan. Learn the issues your manager considers essential to change in a facilitated meeting. Having an executive coach present ensures the discussion is forthright and rich, and allows you and your manager to explore the needed changes with curiosity, instead of defending current behaviors and viewpoints. Address issues revealed in your 360 assessment with your team in a meeting facilitated by your executive coach. Get more detail about their recommended changes and underlying issues. Help them understand and trust your motivation to make changes.